Interactive Media Solutions - in cooperation with the Graz-based agency Mörth & Mörth - created some extraordinary media installations for the booth of Vogel & Noot at ISH 2013 in Frankfurt/Main. The innovative modules played an important role for the attractivity of the booth. The main communication tool of the booth consisted of 4 videowalls, one central wall in the open entrance area with a size of 5 x 3 m using sixteen 55" screens plus three further videowalls, each one comprising nine 55" screens. For these videowalls, Interactive Media Solutions created a complete visual world in 4k resolution; videos of the different products were integrated into this world. Thus, the main theme of the whole booth was perfectly communicated on the video walls. The highlights of the booth were the interactive show and gesture-based presentation which took place two times a day. The show was performed by two dancers from our partner Essentials. Interactive Media Solutions created and programmed the complete interactive show in cooperation with Essentials and Mörth & Mörth. 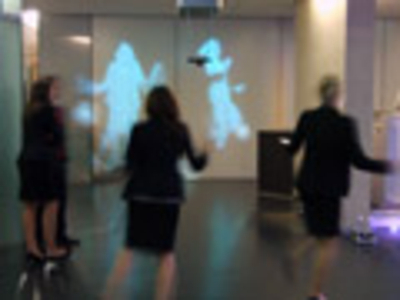 With the help of two Microsoft Kinect sensors, the whole area in front of the large screen was made interactive . The sphere was again the main visual element again. The dancers were able to throw spheres to each other at the beginning of the show. At the second part, they built logos of the different products using thousands of small spheres. Each sphere was reacting exactly to the movements of the dancers. Directly after the show, the interactive, gesture-based presentation took place. The moderator was able to navigate through the presentation with the help of gesture-recognition technology. Through the development of a newly customizable gesture set, a recognition accuracy of almost 100% could be reached. The visual world of the live rendered presentations was also created by Interactive Media Solutions, and contained product videos within the created 3D-world. "With the development of the five main elements, the interactive show, the gesture-based product presentation, the 3D video-world, the USB download station and the entertainment part for the booth party, Interactive Media Solutions did a premium job and made this event an absolute highlight for our customer. We are looking forward to working together on further ground-breaking projects."